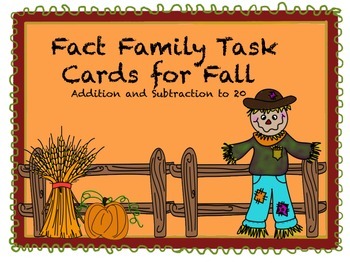 This set of Fact Family Task Cards is a great resource to strengthen students' math fact fluency. Use to practice for my Fact Families Assessment!! The set includes addition and subtraction facts up to 20 and has a variety of different multiple choice questions (the type students may see on assessments) for higher level thinking. For example: "Which number sentence does NOT belong to this fact family?" as well as several task cards in which the equal sign is listed first in the family. For example: 17 = 15 + 2. This helps to ensure students understand the entire concept for the equal sign. 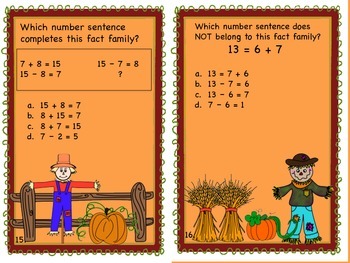 In addition, I have included some word problems for the students to determine the fact family that matches the problem. There are 24 different Fall themed cards included in this set as well as an answer key. The cards have been numbered for activities in small group, use with the document camera or for "Scoot" type games. kj2 is the sole creator of this product and does not claim endorsement or association with the creators of the CCSS standards.